I used to wonder how people, especially converts, could after finding Islam later leave the faith altogether. I’ve been thinking about this a lot recently and of my friends who no longer identify as Muslim. Everyone’s life experience is unique but I can’t help wondering if some of my friends left simply because they couldn’t find a safe place within the religion for themselves. I wrote about this earlier in forgiving ourselves for not being perfect. The more I reflect on it, I’m almost certain that many people leave because we’ve encountered a theology of bullies that does not empower us to deal effectively with the pressing issues in our lives. I was young, insecure, and confused about a lot of things when I converted to Islam. I was certain that I believed in God. I liked the easy and comprehensive answers and a well-defined life path that Islam provided. I was attracted to the repeated calls in the Quran to think, reflect, and ponder over its verses and the signs in universe. In my new convert zeal, I was overwhelmed with a desire to not only ground but also to prove myself in my new faith through learning and practice. It was then that I encountered the theology of bullies and I fell in love…with it and my own ego. Looking back, I see how naive I was despite my quest for sincerity, which was I think and hope quite sincere. And afraid. 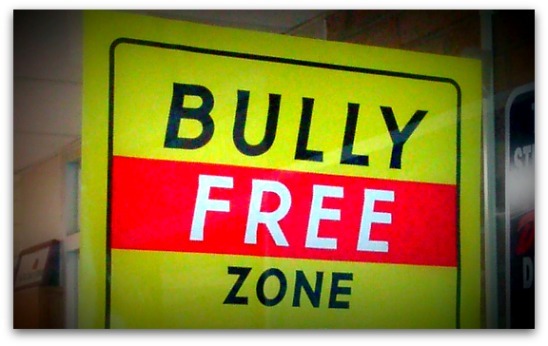 Fear is used in theology of bullies to force each person into submission. But this fear thing is a tricky business. If God is worshipped out of love, fear, and hope then surely some fear is a good thing? But in the theology of bullies there’s another type of fear, a fear of displeasing people and of public censure. This secondary fear causes a lot of emotional distress. Some people believe that’s a good thing and to others perhaps a sign of hypocrisy. It’s a tricky thing because we want so very much to be sincere. Take any issue, promote your own understanding as correct and closest to the divine decree, and then mock, ridicule or revile those who differ. Setup the equation so that the good Muslim or more precisely, a Muslim, is the one who agrees with you. Thereby putting the faith of those who disagree with you into doubt. This is how the theology of bullies gets you. If you don’t agree with them on everything hook, line, and sinker then you’re sunk or they’ll set out to sink you and your faith by playing on your insecurities. xcwn blogs powerfully over at A Sober Second Look about the damaging effects of the psychological, emotional, and theological manipulation many of us have experienced. I see myself in much of her writing. I consider myself in the process of recovering from the theology of bullies, still holding onto my faith in God and in Islam but discovering anew what that means for me as a practical reality. I’ve learned enough to pass pretty effectively. I know the arguments, the evidences, and proofs inside and out. I can wear the clothes and say the right words and this affords me a certain level of privilege but I know the truth. I don’t believe in much of the way Islam has been presented and taught to me. And I now know that disagreeing with the opinions of others doesn’t mean I’m disagreeing with God. It just means I disagree with you. Shall I be sentimental or should I keep it real? Or is this one of those dreaded multiple-multiple select all that apply questions? 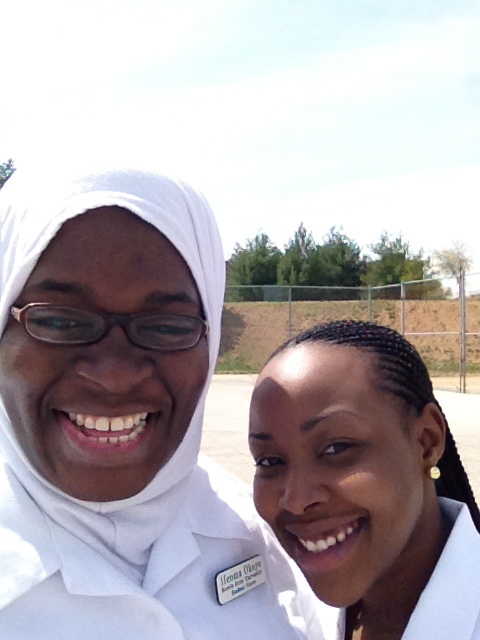 I began nursing school in awe of the nursing knowledge of my professors and the students ahead of us. 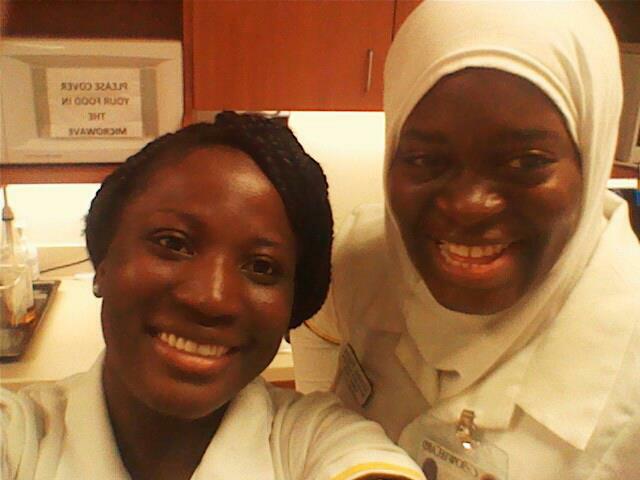 As I leave, I’m still in awe of the nursing knowledge and alpha, beta, and charlie personality characteristics of my nursing instructors, and am humbled by how much we still have to learn even as we begin the celebratory circuit of pinning and graduation ceremonies and parties to celebrate our accomplishments. I’m mindful of my current and former classmates who will not be with us as we walk across the stage next week knowing that I could easily have been in that same boat. Dr. Barkley taught us to remember that each person is a “pyschosocial, cultural, and spiritual being” and that we have to keep this in mind when working with and advocating for our patients. She kept us in check with frequent reminders to observe “professional courtesy on the floor” even while walking through the hallways at school and by asking us, “what’s your reference?” to make sure we really had read before class and weren’t just making stuff up. From Dr. Miller, I learned humor is good and keeps class moving along but unless you know the material you won’t get very far. From some instructors I learned how I’d like to be and from others I learned habits I’d like to avoid. From Dr. Persaud, I learned the most valuable lessons. That some things are unacceptable, that the way we choose to conduct ourselves can make or break us, and that we have to look inward at our own flaws and actions when situations go awry. I’m humbled by the care, compassion, and integrity I saw from nurses as they struggled to meet the needs of their patients and balance those with a myriad of other concerns. I learned about team work and noticed I gravitated toward and away from certain types of people in my personal relationships. I learned from my patients about facing death or chronic and debilitating illness with grace and dignity. I learned not to presume that I can accurately judge another’s pain. I learned about the quiet spaces inside myself where I go to help deal with pain and suffering I’ve witnessed. And I learned the importance of prayer, making time to have fun, and having a good support system to help me to get through those darker moments. I’m learning how powerful words and ideas are. I’m working and trying hard to improve the quality of my speech and to restrain myself when words will not better a situation. I’m learning not to laugh at others because I haven’t been tested with what they have been and I can’t put myself in their shoes. And that type of hard-hearted laughter is a sign of arrogance. I want to be humble, I want my heart to be soft even as it makes me vulnerable, and I want to live with sincerity and integrity. I’m beginning to think more like a nurse and I’m beginning to live more like a decent human being. That’s what I learned in nursing school. My sincerest thanks to all of my teachers, those that I named and those that I didn’t name, I’ve learned a lot. As the Friday evening rush hour set in around the DC beltway, I and hundreds of other Muslims battled through traffic, which more than doubled my travel time to get to the ADAMS Center mosque in Virginia. I arrived before the event and helped a parent carry in some boxes of Girl Scout cookies before making my way toward the gymnasium/multipurpose event room. 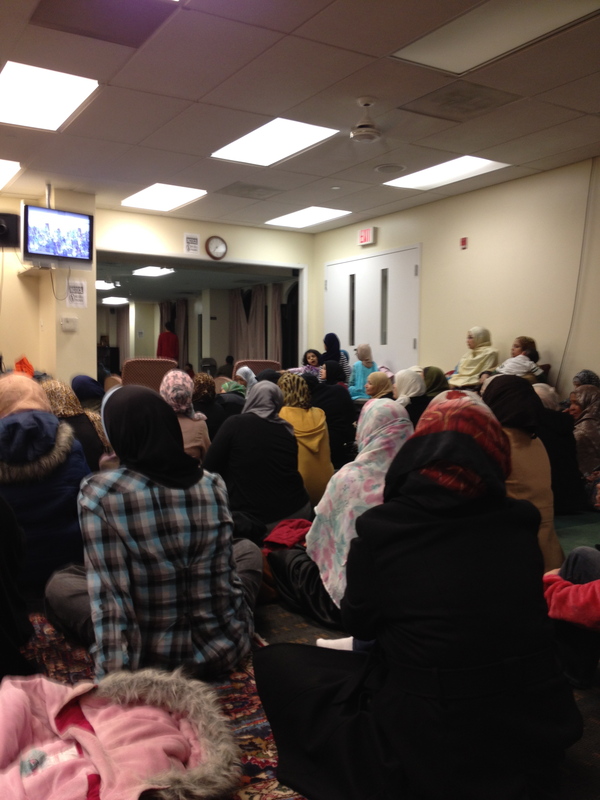 Before I even took off my shoes, I met an old acquaintance who said that the room was full and that we might as well make our way upstairs to the overflow space in the musalla. For a moment I considered trying to squeeze my way in but instead reluctantly decided to go upstairs knowing that the experience would be inferior. And it was, although, I give the organizers props for trying. A television monitor, a bit on the small side, had been setup with close circuit feed to the program downstairs in the gym. The camera appeared as if it were placed on the furthest possible wall at the highest possible angle so we couldn’t really make out any of the main speakers. Some extra speakers had been brought in to amplify the sound so at least we were able to hear if not see. Dr. Jonathan Brown, a hadith scholar at Georgetown University, opened by highlighting some of the pitfalls he sees in many western universities, which he described as having “sterile” and “amoral” environments. In such settings, moral thinking based in religion is often seen as an impediment to progress and enlightenment. According to Brown, most academics are afraid to weigh in on the political and moral issues of the day fearing a backlash or being accused of trying to “force” their personal convictions on others. For a Muslim student raised in environment of black-and-white morality and where a spirit of inquisitiveness is not encouraged, a college environment, which does not nurture their faith can lead them to question everything they believe or had been taught to believe. According to Dr. Brown, this is one reason many colleges began as religious institutions that had a strong moral framework. Dr. Brown hopes that the Muslim community can pool its resources to create more institutions like Zaytuna College that can build up and pass on wisdom for future generations of American Muslims. Through these institutions, the Muslim community can show the rest of society the values contained within the Islamic tradition. Today, many young Muslims feel at a loss spiritually and are not sure how to respond effectively to the changing circumstances we find ourselves in. Rhodus emphasized that having a holistic knowledge of the religion is key to navigating our situation as American Muslims. Knowledge can help the believer understand the context of generalized Prophetic principles, which remain constant, in light of the underlying changing circumstances of today. Hamza Yusuf praised the ADAMS Center as a model American Muslim community but cautioned the audience not to become complacent by mentioning a narration from Abdullah Ibn Umar: When a believer is praised, he works harder, because he knows it [the praise] is always more than he deserves but when a hypocrite is praised he become lazy because he is pleased that people think good things about him. Yusuf then reminded the audience that the religion of Islam is based on knowledge. The revelation of Quran began with the word Iqra, which means to read or recite and that this knowledge is a gift given from Allah. Knowledge can raise a people and communities in ranks but only if we remain humble. In some narrations of the famous hadith “Seeking knowledge is obligatory on every Muslim,” Yusuf explained that some scholars added the words “wal muslima” so that everyone would know that learning is obligatory for both men and women. 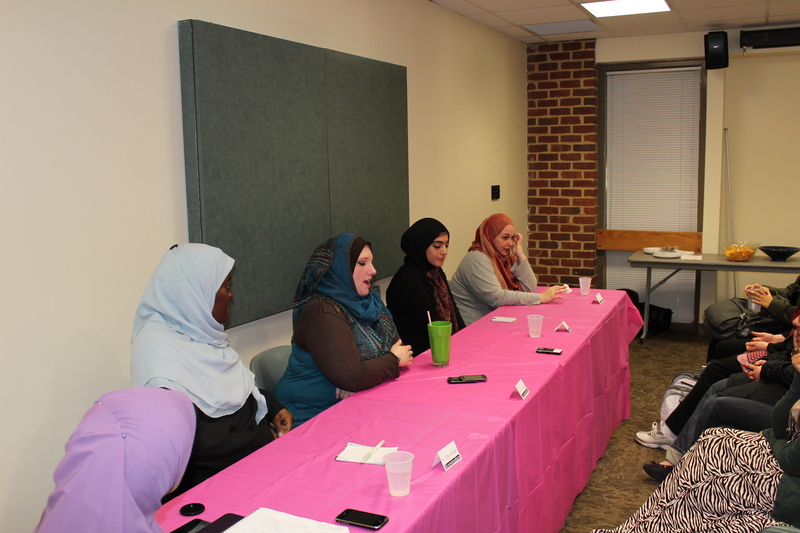 Many thanks to Ayesha & Asma Ahmad and the George Mason University MSA for inviting several Muslim converts including me to speak about our experiences for their Conver(t)sations event in early March. Avoid using the word “kafir” or its plural “kuffar” in the pejorative sense to refer to all non-Muslims. It’s hurtful for us to hear our families, friends, and loved ones denigrated in that manner by other Muslims. I prefer to use people of other faiths or “poofis” as I once heard Imam Johari Abdul Malik say. Side Note: I cringe like most people when I hear my recorded voice, part of that is a natural shyness and part of that is from being criticized for not sounding “black” enough when I was younger. I can definitely empathize with Jordan Shumate, a high school student rebuked by his teacher for not reading a poem by Langston Hughes in a “blacker” manner. The topic of race and racism amongst Muslims deserves a talk by itself. Four years ago, during the previous presidential election, I tried to work out some issues relating to being seen as both authentically black and Muslim here and here. Yesterday, I wept at the courthouse. Not because I had to miss class to contest a speeding ticket nor because my officer decided to show up nor because I feared my auto insurance rates would go up. Even though, I had secretly hoped the officer wouldn’t show up, I’m glad he did, otherwise I would not have wept nor learned a lesson. I would not have wept because my case would have been dismissed early on and I’d have left the courtroom before any of the trials took place. So I stayed and during the first trial, I wept as did many in the courtroom that morning for the loss of man I didn’t know. Seated around the prosecutor’s table was the dead man’s wife and son. He has other children too and young grandchildren, the youngest, the one he never met, born last December, carries his name. His wife wrote a letter to the judge detailing how the loss of her husband of forty years, her high school sweetheart, and business partner had affected her. She said she felt as if she were missing half of herself. Her son began to read from the letter until overcome with emotion he handed the letter to the prosecutor to finish reading for him. Also seated around the prosecutor’s table were the court’s translator and the two Latino men who had worked with the woman’s husband and were with him that fatal day. At the other end of the courtroom was the defendant, a man perhaps in his late forties or early fifties, a retired military veteran and firefighter. His hair was closely cropped and his face red with the emotion of a man trying to hold back tears. While it was easy to feel empathy for those sitting around the prosecutor’s table, I didn’t know what to feel for this other man. But even for him, I can only feel empathy for a man forced to carry his burden. One rainy day, three men stopped their van on the side of the road to adjust their windshield wipers. Two were outside and one stayed inside the van. Without warning, their van was struck by another vehicle at speed. The power of the impact forced the now deceased man’s head through to the outside of the van. His companions also sustained serious injuries. They have had multiple surgeries since the accident and may suffer some permanently disability. Neither, both manual laborers has worked since the accident. One of them has a wife and two small daughters and worries how he will be able to support them. 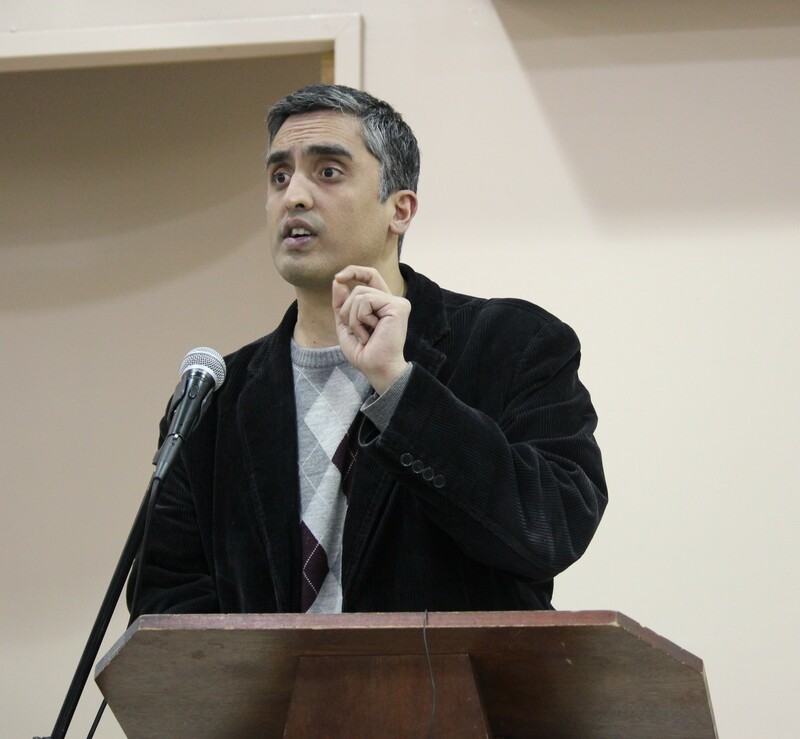 This past Sunday, I attended an interfaith event at the ADAMS Center in Virginia with Arsalan Iftikhar, a writer and international human rights lawyer. Iftikhar was promoting his new book Islamic Pacifism: Global Muslims in the Post-Osama Era, which he wrote to further his belief in Islam as a socio-political ethos, which embraces non-violence. In addition to countering the politically motivated demonization of Muslims by Islamophobes, Iftikhar hopes to inspire young Muslim boys and girls with the “audacity of hope” to become contributing members of American society. In doing so, he hopes to help Americans, both Muslims and those of other faiths, recognize that it’s possible to be a good practicing Muslim that embodies the golden rule of “loving thy God and loving thy neighbor” and to also embrace nonviolence. ADAMS Center’s imam, Mohamed Magid, who also serves as the President of the Islamic Society of North America (ISNA) reminded the audience of the need for Americans of every faith tradition to take a stand not only against war but against all types of violence. Arsalan Iftikhar believes American Muslims should embrace the principle of being “our brother’s keeper” recognizing that only by protecting the civil rights of every American, even those with whom we differ, can we also protect the civil rights of all Americans. More than 72% of Americans claim to have never met or interacted with a Muslim so Muslims will have to work even harder to humanize ourselves to our neighbors. The work of humanizing Muslims to the American public while daunting is far from hopeless as Iftikhar noted the progress made over the last decade by advocates of gay marriage. According to Iftikhar, “no matter how much of a conservative Republican you may be, chances are that you have a gay cousin somewhere” and this helps to humanize people and issues and “lessens the level of toxicity” in discourse. Each Muslim has a role to play in breaking down stereotypes. Iftikhar says he loves when he gets the opportunity to speak on television or radio about mundane issues like sports or popular culture and not solely about religion or terrorism. When appearing on television, he makes a point of wearing a pink tie or shirt because he knows most people don’t expect to see Muslim man who is “clean-shaven and wearing something colorful.” So that even those who disagree with him can say “I don’t agree with him but I love the terrorist’s tie!” and that in its own way is a small victory. I bought a copy of the book and am looking forward to reading it soon, insha’Allah.